At first glance the ePuffer Electronic Pipe 605 is a very attractive piece of kit and the marble effect is sure to appeal to anyone who is used to smoking a good looking pipe but wants to free their lungs of tobacco tar and make the switch to an e-pipe. Although some e-pipes feel more like a child’s plastic toy, the ePuffer Electronic Pipe 605 actually feels like a real pipe when it is in the hand. This is an important consideration because it should help wannabe ex-smokers make the transition to an e-pipe vaporizer without any obvious reminders that they are no longer puffing on a real pipe. Of course, like any other vaporizer, e-pipes can be smoked almost anywhere so the ability to enjoy a good pipe inside an establishment rather than at the door is not totally similar to smoking, but having to smoke in the wind and rain is a situation most people will be happy to forget. e-Puffer is a market leader in electronic vaping technology. The company has a good reputation for providing quality products and customers can buy in confidence because e-Puffer back all of their products with a 30-day money back guarantee and a one year limited warranty. Many competing companies do not provide either of these things so, in this regards, e-puffer are way ahead of the pack. Customers who purchase the ePuffer Electronic Pipe 605 or any other e-Puffer product also benefit from an excellent level of after-sales service. Customer service representative are are available to speak to by phone during normal working hours (Mon-Fri: 9:00 – 18:00) and there is also an online support ticket service that is available 24-hours a day. 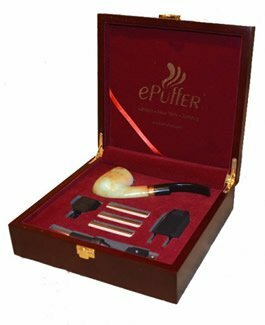 The ePuffer Electronic Pipe 605 comes in a highly-polished wooden presentation box that displays the e-pipe and its accessories so well it puts the presentation boxes sold with many conventional tobacco pipes to shame. In fact, the whole package looks so good it would make an excellent gift. We are impressed with this product and have to say we like it a lot. 1 x Marble-effect Electronic Pipe 605 Bowl with 2 x removable lithium rechargeable batteries. 3 x High Capacity premium tobacco flavour atomized cartridges (provide up-to 900 puffs). 1 x Universal USB/AC Battery adapter. 1 x e-pipe USB charger. 1 x Wooden Gift box. The most special thing about the ePuffer Electronic Pipe 605 is easily the fact that it looks and feels like a real pipe. So it won’t ruin the e-pipe vaping experience by making the user look comical or feel uncomfortable while vaping in a crowd. The other advantage with the ePuffer Electronic Pipe 605 is there is no need for pipe cleaning or maintenance. The atomizer is never reused and there is no need to worry about nicotine build-ups or clogging caused by residue. Once a cartridge is empty it is just a case of unscrewing it and replacing it with a fresh one. With some e-pipes the taste and quality of the vaping experience may deteriorate over a period of time. This is a problem that does not arise with the ePuffer Electronic Pipe 605 because each disposable cartridge has a built in atomizer, so every time a cartridge is replaced the e-pipe user gets to enjoy a first-rate vaping experience from a nice clean atomizer. Better still, e-puffer’s patented cartomizer design ensures such a good vaping experience there will be no tempation to return to traditional pipes or dangerous tobacco products. e-Puffer distributes its products via the Royal Mail and customers who live in the UK usually receive their orders the next working day. Postage and packing charges are waived for all orders that have a value of £25 or more and for orders of €50 or more that are placed from other European countries (delivery in 3-5 working days). What Does the ePuffer Electronic Pipe 605 Cost and is it Worth the Money? At the time of this review it was possible to purchase the ePuffer Electronic Pipe 605 for around the same price a Tesco customer would pay for 120 Benson & Hedges Gold king size cigarettes. Most Tesco customers would see their money go up in smoke in a mater of a few days to a week, but the ePuffer Electronic Pipe 605 will still be delivering vaping pleasure many years later so as far as we are concerned it’s money well-spent. 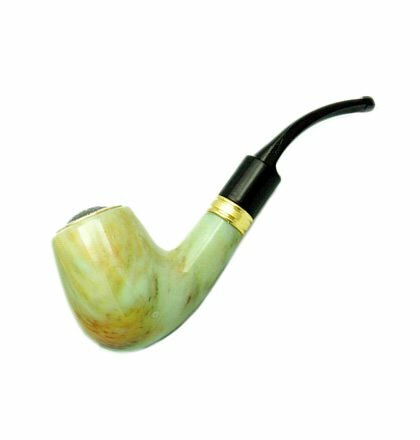 ePuffer Electronic Pipe 605 is only available from the e-puffer website. ePuffer Electronic Pipe 605 is an attractive e-pipe that is sold with all the accessories that are likely to be required thrown in for free and the nice presentation box is just the icing on what is already a very nice cake. It probably won’t appeal to people who want to start vaping as an alternative to smoking cigarettes or cigars, but its is not intended to. It’s an e-pipe designed to replicate the pipe smoking experience. It does just that and we think it likely that any pipe smoker who tries it will quickly discover there is no going back.